Below is a list of the most frequently asked questions we receive about HBOT and Hyperbaric Oxygen Therapy. If you are unable to find the answer to a question you have please send us an email or call us on 504 309 4948. Are there different types of chambers? How are patients referred for treatment? There are basically two types of chambers: monoplace and multiplace. Monoplace chambers are designed to treat a single person pressurized with 100% oxygen. 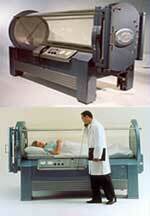 Multiplace chambers are designed to hold several people at one time and oxygen is delivered through a mask or a hood. Only clean cotton clothing is allowed in the chamber. No cosmetics, perfumes, hair preparations, deodorants, wigs or jewelry are allowed in the chamber. The technician needs to know if any medications, including non prescription drugs, are being taken by the patient, and patients are advised not to take alcohol or carbonated drinks for four hours prior to treatment. In most cases, patients should give up smoking and any other tobacco products during their treatment period, as they interfere with the body’s ability to transport oxygen. · If you have any cold or flu symptoms, fever, sinus or nasal congestion, or chest congestion. · If there is a possibility that you may be pregnant. · If there has been a change in any of your medications. · If you have skipped a meal prior to your HBO treatment. · If you are diabetic and did not take your insulin prior to your treatment. · If you have any concerns or anxiety.